Simplifies the workflow between mocha and NUKE. Easily import tracking data into Tracker, Transform, RotoPaint, GridWarp and more. Version 1.1 adds some cool new features like compatibility with machines where MochaImport+ is not installed, a new SplineWarp+ node, a scripting API and the free bonus plugin Relative File Path. Find out more at mamoworld.com. At $123, I’d say the investment is worth exponentially more than the time investment in building the Nuke nodes every time you need them. MochaImport+ for NUKE is a great collaboration tool; making it super easy to have a seamless workflow between Mocha and Nuke. Whether you are bringing into Nuke your planar tracking, stabilized, shape data, or lens distortion maps and adjusting with MochaImport+ for NUKE, can be summarized in 3 words: easy, artist friendly, and pretty rad! With MochaImport+, speed and simplicity are grand, no more need to spend time translating tracking info into different nodes. 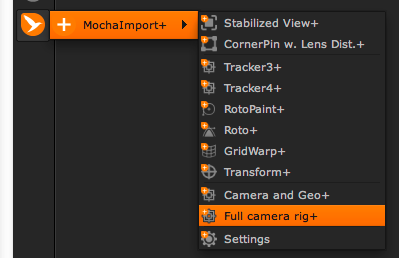 A change in the tracking in mocha Pro, it only takes seconds to update in NUKE. All the time spend getting the best track in mocha Pro is translated EXACTLY to NUKE with MochaImport+. We're always looking to improve our workflow. MochaImport+ for NUKE will save you time. MochaImport+ includes the free bonus plugin Relative File Path that allows you to move your NUKE project from one location to another without breaking your footage links. Relative File Path is fully functional, with no time limitation - even if you just install the trial version of MochaImport+. 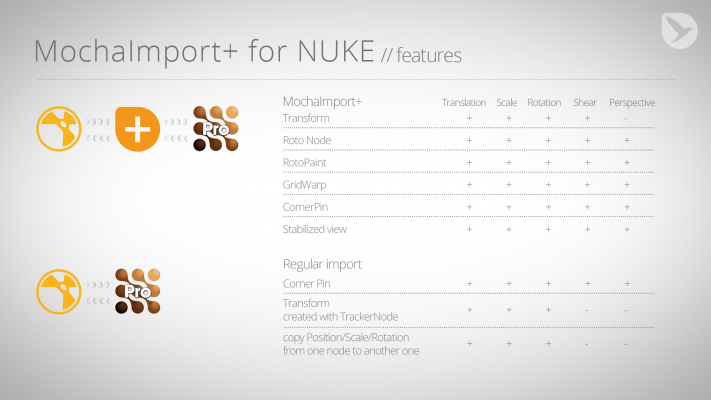 Customers who own MochaImport+ for Ae get a 20% discount towards the purchase of MochaImport+ for NUKE. Simply log in to the same account that you purchase MI+ with. This tutorial uses the SplineWarp+ feature and Stabilized Views of MochaImport+ for NUKE to turn a woman into a younger version of herself. 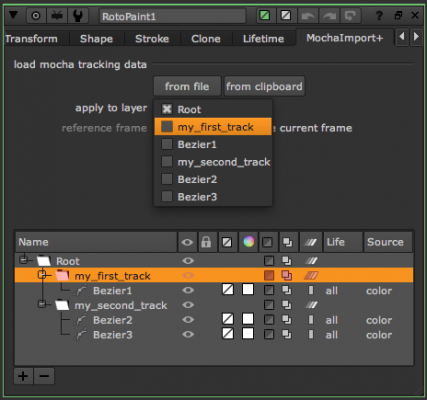 Relative File Path is a free bonus plugin that is included in MochaImport+ and is fully functional without time limitation, even if you only install the trial version of MochaImport+. Easily and quickly turn on/off multiple groups of layers, effects and/or masks in any comp or pre-comp so you can "Preview" your comps faster.